September 1st, the day I owe my entire existence to. It is my dear mother’s birthday. I don’t think there are words to describe how much she (and my dad too) mean to me. I’ll try. This is one fiery lady. Intelligent and fiercely independent. She lost her mom when she was five (can’t even imagine how that must have been), raised her two younger brothers, graduated in Economics, moved to a totally new place after marriage and learnt a whole new language, raised my sister and me to be independent, kind women, touched the lives of her many students and is now busy being just the best grandmother my daughter could ask for. Now, such a lovely lady definitely deserves a treat on her birthday, doesn’t she? 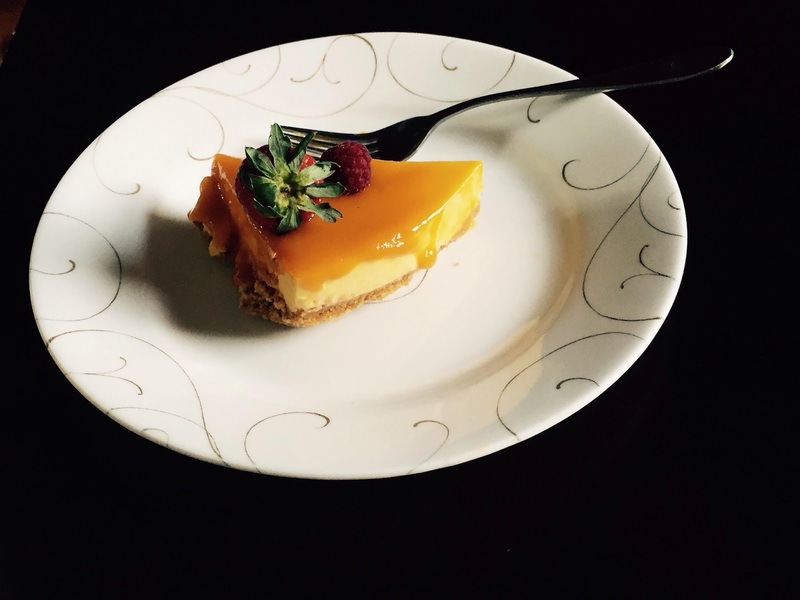 Eggless, No-Bake, Mango cheesecake. It’s similar to my mom, in the sense that I don’t have words to describe how delicious this cake is, either. 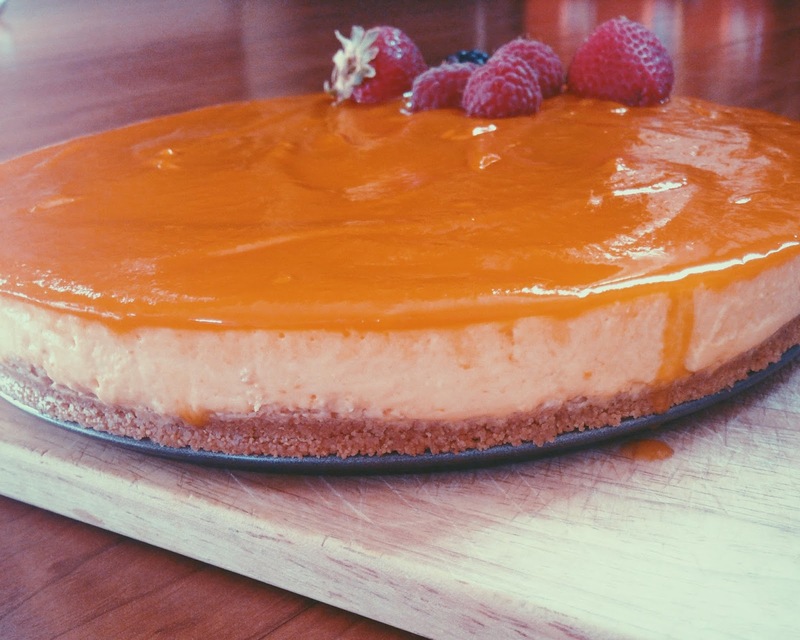 Mango pulp, cream cheese and a mango-lemon glaze! How bad can it be? This recipe makes a 6-inch cake. I couldn’t find a 6-inch springform pan, so I had to use an 8-inch one. So the cream cheese layer looks a tad thin. First, pulse digestive biscuits into crumbs. (Tip – Add a tablespoon of cocoa powder to this if you want a chocolate crust). With the food processor running, add the melted butter through the feed tube till the mixture looks like wet sand. Line your springform pan with parchment paper. Dump the biscuit mixture and firmly press it down to form a crust. You can use the bottom of your cup measure to shape it. Put the pan in the fridge till you get the rest of the cake ready. Add gelatin to warm water and make sure it dissolves completely. Gelatin lumps are super yucky, trust me, I know 😉 Add this to 3/4 cup of the mango puree and set aside. 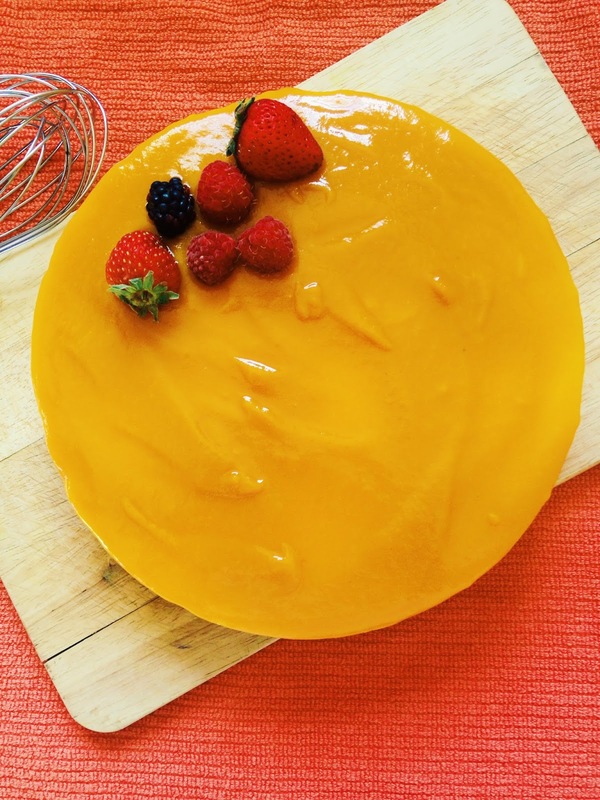 Mix the cream cheese, sugar and milk and then add the mango and gelatin mixture. Mix well until everything is well combined. Pour this over the digestive biscuit crust. Cover with cling film and refrigerate for about 3 hours. 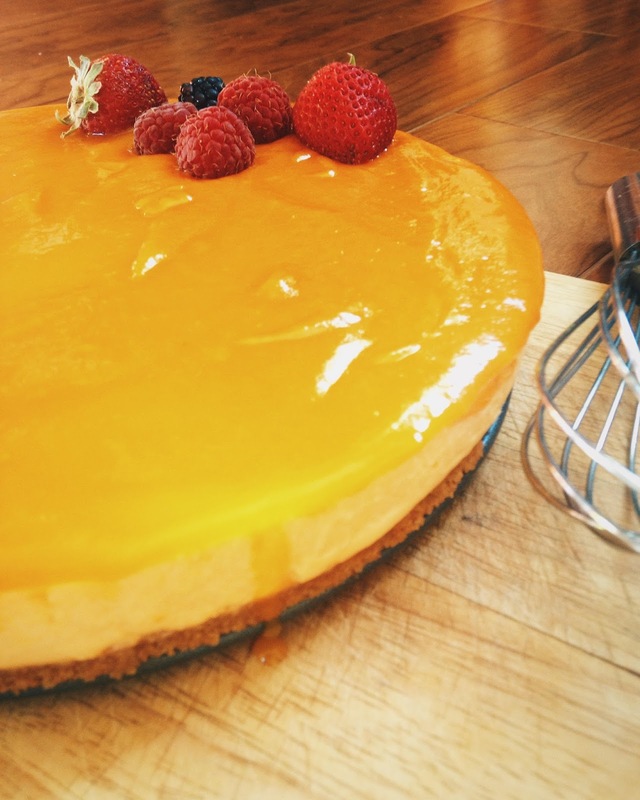 Pour the mango-lemon glaze and refrigerate again, preferably overnight. Combine all the above ingredients over medium flame till it thickens. You could add a little bit of cornstarch to thicken it further, but I prefer a thinner, pouring consistency so I skipped the cornstarch. When it cools, pour over the cheesecake. Note that it is important to refrigerate the cake for at least 3 hours before you pour the glaze over it, or the glaze will just mix with the cake and you won’t get layers. 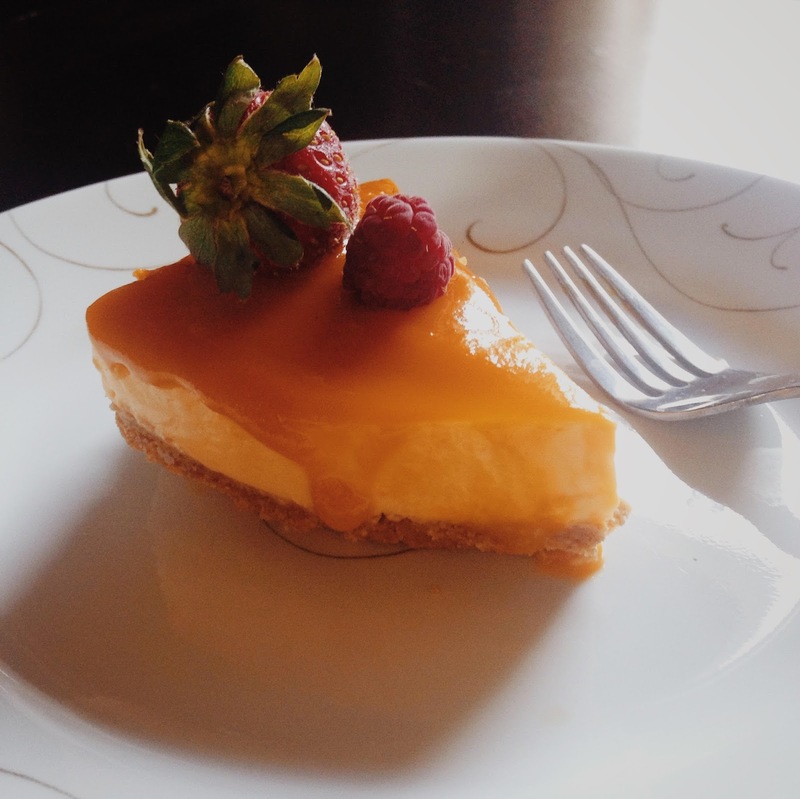 Honestly though, this doesn’t taste like traditional cheesecakes. It’s somewhere in the Panna Cotta and Mexican Flan spectrum. Which is not a bad thing. At all. Tomorrow, we leave for the Happiest Place on Earth. See you, folks! Awesome Hema.. 🙂 simple and elegant.. It is 🙂 Thank you, Anjali! haha! Thank you, Indrani 🙂 Always nice to hear from you! Thanks for your wishes, Alok! She is a superwoman. Hats off to her. Belated wishes and I will surely try this recipe.